Pale yellow to dark brown if impure. Mustard gas is a type of chemical weapon used commonly in warfare. It has the ability to create large blister on the exposed skin and in the lungs. When the gas is purified, it is odorless and colorless. On the other hand, when it is impure, mustard gas is usually a yellow-brown color and smells like garlic, onions, or mustard plants. Despite the name mustard gas, is is not gas but a thick, volatile liquid. When mustard gas is in its pure state, it has no color and almost no odor. When the temperature is low, mustard gas is in the form of a liquid and is very stable during storage. In order to use mustard gas, it is mixed with other agents and is utilized in to a gaseous form. Some of the agents that is mixed with are lewisite and polymers. This gas can easily be dissolved in most organic solvents but does not mix well with water. Mustard gas is heavier than water, and is highly soluble in fats. When it is mixed with other liquids the decomposition process is slow. Mustard gas has a melting point of 13 to 14°C and boiling point 215 to 217°C. The vapour pressure is at 0°C is 0.025 mm and at 30°C it is 0.090 mm. Mustard gas vapour is extremely potent. It penetrates wood, paint, cloth, and leather. Since mustard gas is heavier than water, it sinks to the bottom of lakes, oceans, and streams and remains in the water as a local source of poison for a long period of time. When in contact with sea water turns mustard gas from liquid into a thick liquid or even a solid form. It is said that large quantities are still lying on the bottom of the Baltic Sea where they were dumped over 70 years ago. Mustard gas was first used as a weapon by the Germans in World War 1. During World War 1, chemical weapons were used to injure and kill enemy soldiers. Mustard gas is a slow moving or static gas clouds which is invisible. It causes the victim to have symptoms which are extremely painful and slow acting. By using this gas, many soldiers would become incapable of performing their duties, therefore making the army weaker and less powerful. It was first used against the British Army in September 1917, and later against the French Second Army. 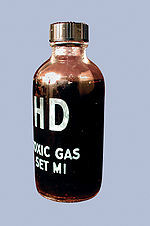 Since it was one of the most powerful and lethal poisonous chemicals, it was commonly used during the war. The widespread use of mustard gas during war time gave rise to the view that World War 1 was "the chemists' war". 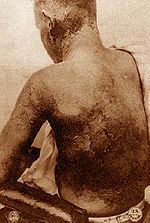 Mustard gas has also been used for land mines, rockets, artillery shells, mortar rounds, and aerial bombs. The effects of using mustard gas were overwhelming. When the Germans used this agent against the British, 2934 people were admitted to the medical units during the first week that it was used. Before that time, they have been treating about 300 people a week for inhalation of chemical gases. In only the first three weeks of mustard gas use, 14,296 soldiers suffered severe injuries. The mustard gas that was not used in warfare was dumped into the various seas and oceans of the world. Much of it was found between 1966 and 2002 in the Baltic Sea. This gas contains sulfur mustard mixed with a thickener and lumps form which contain the active sulfur mustard for many years. When found by fishermen and brought up to the surface by fishing nets or by hand this gas can be dangerous to the fishermen many years after it was dumped. Artillery shells from World War 1, containing mustard gas, can still be found in France and Belgium. In 1972, the U.S. Congress banned the practice of dumping chemical weapons into the waters surrounding the United States. Many other countries followed suit. This gas was still used by Iraq in the 1970's and 1980's in their war with Iran. Mustard gas lost its popularity for use as a chemical weapon in the 1990's. ↑ 1.0 1.1 1.2 Author unknown. What is Mustard Gas?. Wise Geek. Web. September 1996. ↑ Ivarsson U, Nilsson H, Santesson J. Mustard Agents. Organisation for the Prohibition of Chemical Weapons. Web. accessed 29 January 2012. ↑ Author unknown. Sulfur Mustard. Wikipedia. Web. accessed 29 January 2012. ↑ Author unknown. Mustard Gas. Spartacus Educational. Web. accessed 27 January 2012. ↑ Author unknown. PHYSICO-CHEMICAL PROPERTIES Mustard gas. IPCS Inchem. Web. accessed 29 January 2012. This page was last modified on 8 July 2013, at 19:01.